Summer strawberries are really looking good. This is a delicious and refreshing way to serve them. The biscuits here are very light and fluffy ,not at all heavy like traditional country biscuits. Combine the flour, baking powder, baking soda, salt, sugar and lemon zest. Add the cubed butter and work it in to the flour mixture until it resembles coarse crumbs. In a small bowl, whisk together the Dannon Oikos Plain Greek Nonfat Yogurt and milk. Then add it to the flour and butter mixture. Stir just until the dough comes together then knead it the rest of the way, being sure not to over work it. The dough will be slightly sticky when finished. Turn the dough out on to a floured surface and press it out to 3/4 inch thickness then cut it into rounds, pressing straight down and not twisting. You can use a circle cutter for this or a drinking glass. Lay the biscuits out onto a baking sheet and brush the tops with a little bit of Dannon Oikos Plain Greek Nonfat Yogurt then sprinkle them with sugar. Bake for 12-15 minutes, or until light golden brown. To serve, slice a biscuit in half like you are cutting open a hamburger bun. Spoon some of the strawberries along with plenty of their juices on to the bottom half. 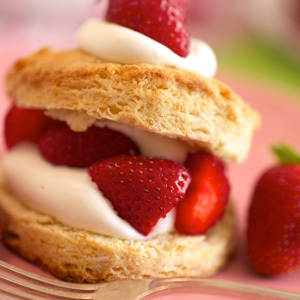 Spoon some whipped cream on top of the strawberries, and then top with the other half of the biscuit. Combine all ingredients and let sit at room temperature for 20 minutes, until the strawberries release their juices. Using the whisk attachment to your mixer, whip the cream and the sugar together in medium speed until soft peaks form. Refrigerate until ready to use.